CBRE’s Gregg Rothkin and Gerry Miovski (middle) at REBNY’s annual cocktail party Tuesday evening. One of Manhattan’s ugliest buildings ended up being a real eye catcher for the city’s top brokers. 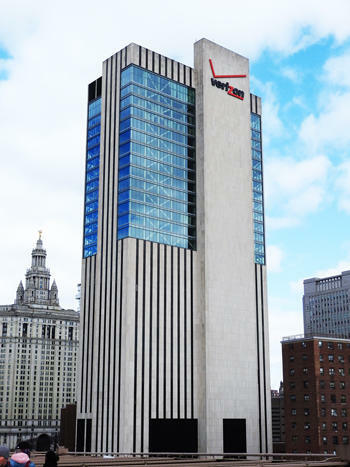 CBRE’s Gregg Rothkin and Gerry Miovski – leasing agents on the former Verizon building in the Financial District – took home the Real Estate Board of New York’s Most Ingenious Deal of the Year award for their work helping to transform the former eyesore. The “brazen leasing duo” took home the Henry Hart Rice Achievement Award for their work with building owner Sabey Corporation to lease up 15 floors at 375 Pearl Street, Savills’ Woody Heller, co-chair of REBNY’s Sales Brokers Committee, announced at the group’s annual cocktail party Tuesday evening. Rothkin and Miovski first leased about 250,000 square feet to city agencies, a spread that eventually grew to 615,000 square feet. But they still had the challenge of leasing up the building’s penthouse floor, which the city couldn’t afford. The CBRE brokers brought in Rafael Viñoly Architects, which took the penthouse space. The Kaufman Organization’s Jeffrey Rosenblatt nabbed the second-place Robert T. Lawrence Memorial Award for his work leasing 51,000 square feet of Times Square space at 1601 Broadway to Open Jar Studios, which will use the space as one of the city’s largest rehearsal studios. 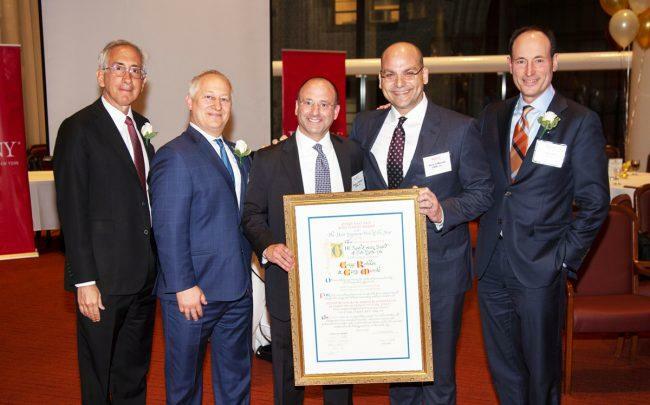 Colliers International’s Alan Desino brought home the third-place Edward S. Gordon Memorial Ward for his deal representing Evercore in an expansion to 300,000 square feet at Park Avenue Plaza. For all the festivities, though, there was a bit of a dark cloud hanging over the night’s celebration. REBNY’s awards committee received only six submissions for this year’s contest, none of which represented sales deals.